Frog - thanoscardgamess jimdo page! This game derives from the game Tappen, which appeared in Southern Germany, Western Austria and Switzerland around the beginning of the 19th century. Frog (whose name comes from the German Frage (question)) is described in many card game books. Like its ancestors it is 3-player using a 36-card deck. It is playd in southern US and Mexico. 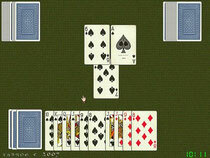 This is a point-trick game: the object is to win tricks containing valuable cards. Each hand opens with a bidding round to determine who will be the solo player. There are three possible bids. Each player must follow suit if possible; anyone who cannot follow suit must play a trump card if he can.